What types of educational programs do you offer? 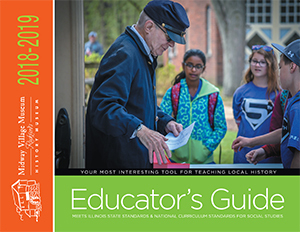 The Education Department offers a variety of school education tours, outreaches, Civil War Hands-on History, Home School services, third grade interactive, and custom education programs for a variety of age groups. Adult outreach programs, museum and village tour and heritage garden tours are also available. To schedule a program or tour, please use our Tour Request Form. If you are having difficulties with the form, please send your request with all information to educator@midwayvillage.com. Program costs vary according to the type of program and age of the group. Most school tours range in price from $5 to $7 per person (link to education tours, outreaches, Civil War hands-on history, and third grade interactive local outreaches). Adult tours are $6 to $8 dollars per person. Please see our Heritage Garden Program page for information and rates on that program. How far in advance should we reserve fieldtrips? Museum center tours are available year round. Tours of the Living History Village are only available March-November. Spring dates for Living History Tours tend to fill up quickly, so we recommend you call at least 6 weeks ahead to reserve your preferred date. Do teachers and bus drivers have to pay? Teachers and bus drivers are free. For field trips, one adult is free for every 10 children. Payment is due on the day of the activity. We accept cash, checks (made payable to Midway Village Museum) and Visa, Master Card and Discover cards. Buses should drive down to the far end of the parking lot, near the DollsHouse. Our Educator will meet you there with to help you connect with your guides. If you are planning on eating lunch on site bring a sack lunch and drink for all members of your group. Lunches can either be left on the bus or moved into one of our museum buildings after you arrive. Several picnic areas are available on site and indoor space will be arranged in case of bad weather. Busses should park in the main museum parking lot. Parking is free.